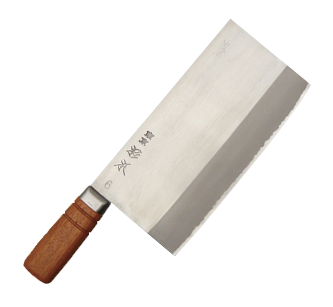 There are various types of kitchen knives, such as Japanese kitchen knives, western-style kitchen knives, and Chinese-style kitchen knives. Please select the product according to the intended use. By using a knife that cuts really well, you will reduce the damage done to the food on a cellular level during the cutting process. Less cellular disruption helps maintain the freshness and texture of the food as well as its nutritional value. This is particularly true when you use a deba knife to fillet your fish. You will be able to experience the true flavor of the fish and enjoy delicious fresh fillets. 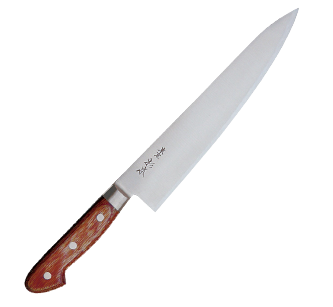 This is a kitchen knife for a wide range of uses that include meat and vegetables. 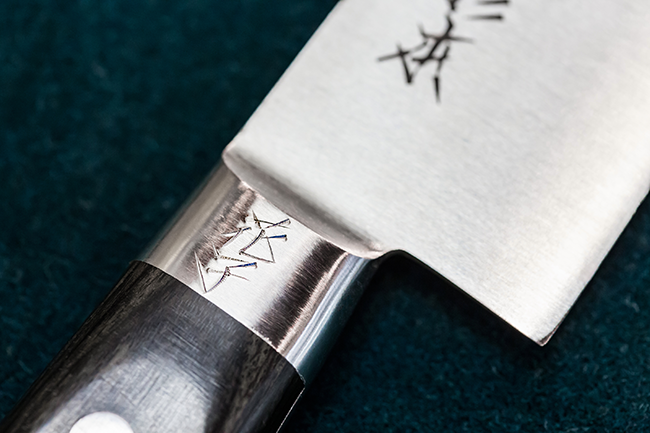 The most commonly used size is a 180mm blade. 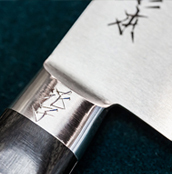 Although a gyuto with a 210mm blade is easy to use for chopping and shredding, it may not be that suitable for peeling and skinning. 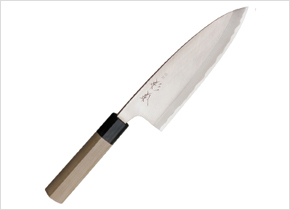 * The gyuto has a thin blade and should not be used on hard items such as bones or frozen foods. Used for fine work such as peeling and shaping fruit and vegetables. 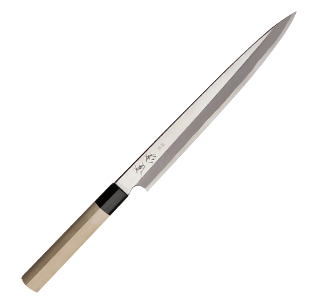 Although 150mm is a little on the long side for a petty knife blade, you will find this length to be very handy when you cut food on a cutting board. This is a knife that is used to fillet fish. 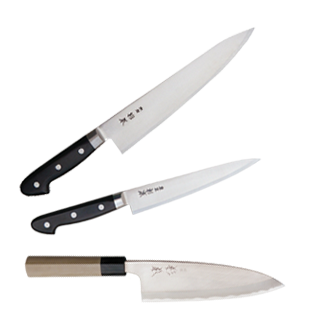 Choose your knife to match the size of the fish that you will fillet. 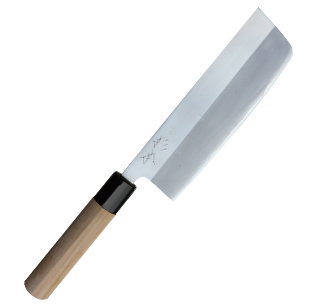 We recommend a deba with a blade length of 150mm for domestic use. 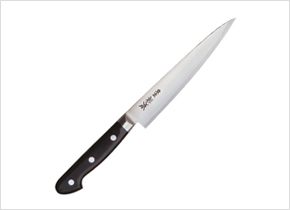 Please be aware that if the blade is too short, you will have to exert too much force when you cut. Some knives rust more easily than others, depending on what kind of steel they are made from. 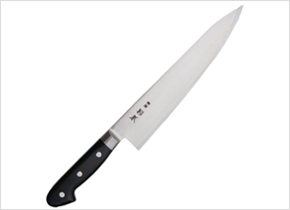 Carbon steel is made from iron and five other elements (carbon, silicon, manganese, phosphorus and sulfur). It has a high level of purity and can be easily worked. Its internal properties when make into products is also good. 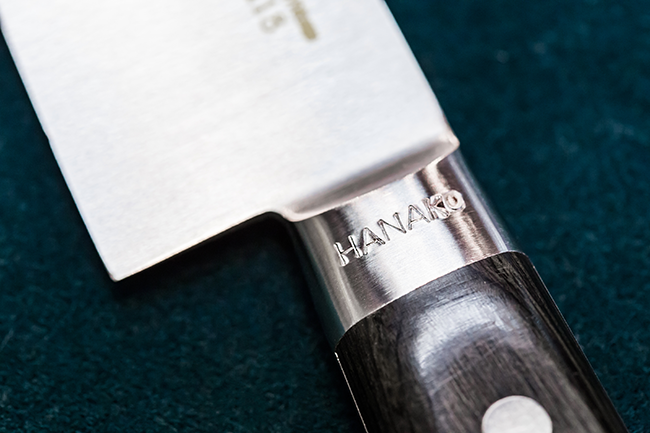 Carbon steel blades hold their sharpness very well. difficult to look after and rusts easily. Made from iron and the 5 elements used in carbon steel + chrome, tungsten, vanadium and certain other elements. Although special alloy steel is not as easy to work as carbon steel, it will cut well if properly heat treated and processed. resists rusting under ordinary use. Due to the nature of the inscribing technique, hand-carved characters tend not to have curved lines. * Names cannot be inscribed on the following products.